This was my first adventure into the world of 2s whoops, and the Beta 75x did not disappoint! I was immediately happier with the box it showed up in. I know it seems small, but if you've ever received a half smashed drone box in the mail, you will be happier with the box as it is much sturdier. 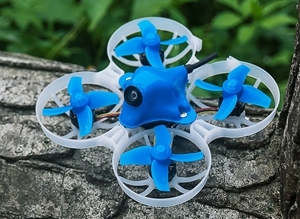 The Quad came with a single Betafpv 2s 350Mah battery and an extra set of propellers. I would highly recommend purchasing extra batteries with this thing; who can get by with just one battery? The frame is nice and sturdy and has already held up to a few good hits.